Strategy Class® is a program to teach strategic thinking skills and strategic planning tools and methods. It is for entrepreneurs and company leaders that want to strengthen their ability to think and lead with greater clarity and confidence so your efforts (and those of your team) are more productive and successful. 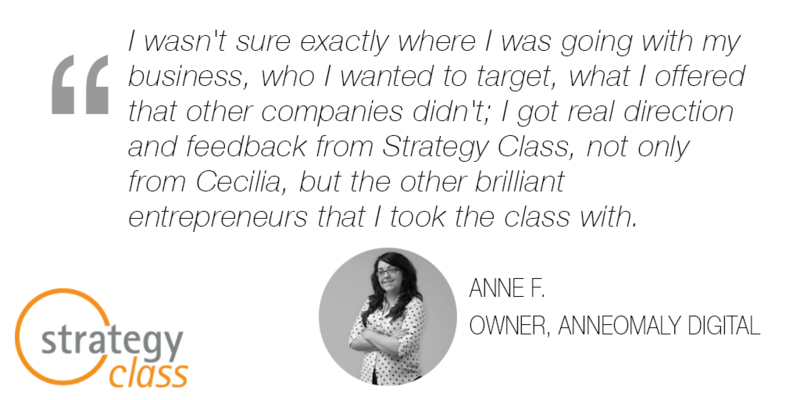 Strategy Class® is delivered in half or full-day workshops or online courses. The training environments can vary: public workshops have open registration or private workshops can be customized for a team or work group. 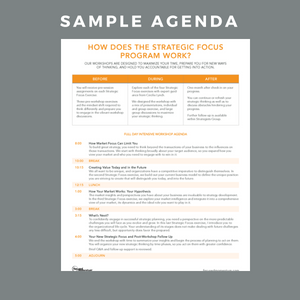 NEW: the STRATEGIC FOCUS online program. You get the tools and techniques Focused Momentum® has used with corporations and non-profits to create successful growth plans. You get access to your own Chief Strategist, Cecilia Lynch the author of Strategic Focus: the Art of Strategic Thinking and her over 20 years of guiding strategic planning. In many ways, developing strategy can be very exciting. We like to say it is the most fun you get to have in business leadership. But, for many, it is not easy to get started because it takes a different mindset than our daily management mindset: the "transactional" mindset. Where do I want to go next with my business? Where should I focus my business development efforts? How do I to stand out from others in my field? How do I make the best decisions for new opportunities and partnerships to grow? What should I add or eliminate to achieve my goals?